On the march, supply situations differed regularly and adequate supplies were often hard to be provided, depending on the supply train/wagons and their ability to keep up with the army. More then often soldiers found themselves without bread or water due to supplies not being available. Biscuit or Bread – for the march it would have been more likely that biscuit, similar to ‘ship’s tack’, was used. This was made by mixing flour and water, sometimes with a leaven, and bake-drying it in a flat shape till rock hard. The result was a dry but long-lasting biscuit that was little affected by storage. It was said that the weevils and maggots that infested these after a while were what kept the eater alive, rather than the biscuit itself. Peas fresh and dried – Dried peas would need to be soaked then boiled so this required heavy cooking pots. Two varieties of peas were available, garden and field peas. The dry variety was most certainly issued by the army. dried peas would have been used as a thickening agent as they are prone to break easily. For re-enactment purposes we suggest that you use dried marrow fat peas which can be bought from your local supermarket. Smoked bacon – As for the meat content of the diet, dry-salted was the norm for the march. This meat was known as ‘bacon’, a corruption of the Spanish, and referred to any meat, rather than just what we know as bacon today. This meat would have been cut into slabs about two inches thick, rubbed with saltpetre and maybe sugar, then covered in salt and left to cure for several days. It would then be dried and sometimes smoked. The resulting meat was hard, dry and very salty, but would remain edible almost indefinitely, at least in period terms. Dairy – Soldiers would have been issued the most common cheese of day which would be hard crumbly texture something resembling that of a Caerphilly or Wensleydale of today. There would be vast varieties of cheeses depending on locality however these would have been out of reach for the common solider. Cheeses tended to be less attractive then its modern counterpart, for re-enactment purposes Caerphilly or Wensleydale is expectable, however you may have to distress the edges of the modern block. Salt – The high quantities of salt issued per solider was generally issued for the commissariats to use for preserving meat. Fresh meat is unlikely be stored in a snap sack, firstly because of the mess that it would make and secondly it would either have been looted or driven with the army. And came from the continent where it was sea water dried in shallow pools. Where as Grey was a product from the North of England made from the brine extracted from wells. Official and un-official looting – The general ration issue was undoubtedly supplemented by looting either being unofficial or official. The common solider certainly would of picked seasonal fruit from trees and hedgerows on the march. 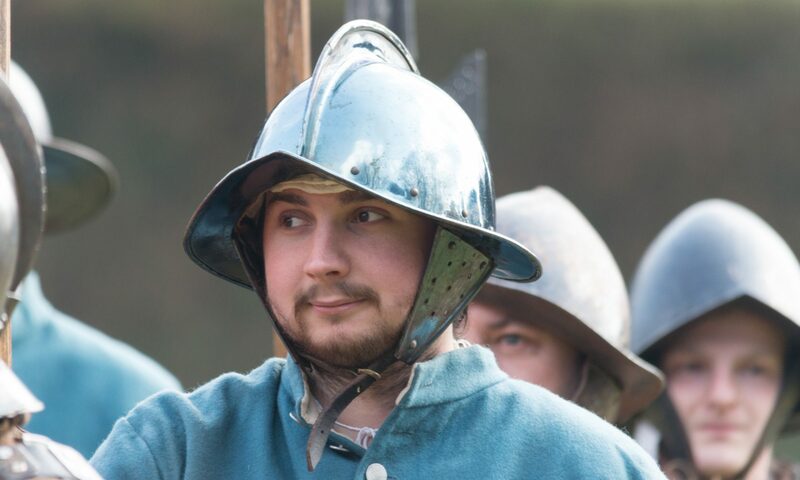 Apples and pears were the most common and an important fruit for re-enactors purposes. Fruit in the 17th century was not waxed and was not treated with an insecticide. Fruit would of come in many varieties and shapes with scabs and wasp holes and other irregularities. Beer – It seems that the most valuable part of the rations would have been the beer. Although of very low alcohol content less than 3% specific gravity the untreated beer would have had a lot more nutrients, together with the effects of live yeasts to supply the body’s needs. It appears that the Royalists were better organized in supplying their soldiers with victuals since bread was baked for the army daily at Oxford and distributed as needed via trains of supply wagons. It is therefore assumed that the King’s Oxford Army was well provided for, at least as far as bread was concerned. Although the issued bread was more commonly termed biscuit, pejoratively dubbed “ammunition bread,” a comment on its digestive properties.